Magnecor 7mm Electrosports 70 Ignition Cables are a direct replacement for 7mm original equipment carbon conductor wires. Conductor provides exceptional RFI and EMI suppression to permanently eliminate the typical performance and fuel-wasting spark energy deterioration of OE and aftermarket carbon conductor wires. Also overcomes performance problems associated with poorly suppressed aftermarket spiral conductor wires on both modern and older engines. The conventional style insulating jacket consists of EPDM insulation and an extra strong EVA outer jacket for better terminal retention needed for small diameter cables. 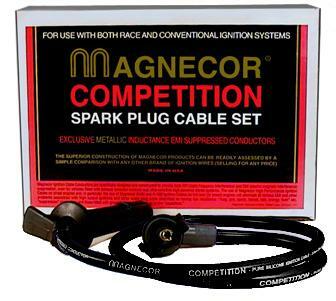 Magnecor ELECTROSPORTS Series Ignition Cables are intended for use as factory replacement wires on both the most recent engines with computerized management systems and older engines with carburetors and/or mechanical fuel injection. All Magnecor Electrosport 70 Series 7mm Plug Wires are Black in color.